In the impoverished neighbourhoods of Kampala, Uganda, growing up can be difficult. In these neighbourhoods, often called slums, poverty and crime are prevalent, and adequate education and sanitation are in short supply. Without opportunities for a better life, many children fall prey to disease or a life of crime before reaching their full potential. It is in these neighbourhoods where Watoto Wasoka, through football, is trying to change the lives of slum kids one game at a time. Watoto Wasoka, whose name means “football kids” in Swahili, was founded in 2009 by a group of football- loving Germans and Ugandans who believed they could guide vulnerable slum kids toward not only potential football stardom, but also the educational opportunities their skills might afford them. “They thought they could create something more than just kids coming and playing, they thought that by bringing so many kids together they could create a hub where the kids could harness opportunities for scholarships, for learning opportunities, and making friends,” said Watoto Wasoka’s CEO Francis Mugoya. Mugoya also believes football is a great way for kids to have fun and escape some of the challenges of living in a slum like drug abuse and disease. Mugoya would know, as he grew up in Bakuli, a rough neighbourhood that borders Kampala’s biggest slum, Kisenyi, where Mugoya said kids choose from as early as 12 whether to go to school or join a gang. Mugoya first became involved with Watoto Wasoka as one of the organization’s “football kids”. Despite his modesty regarding his footballing prowess, Mugoya proved good enough to obtain a sports scholarship that paid for his high school education after Watoto Wasoka gave him a platform to exhibit his skills and connected him with a scholarship opportunity. Perhaps proving more gifted in the classroom than on the pitch, Mugoya then went on to attend college after receiving a government scholarship, and now runs the organization that gave him his break with six part-time staff and 30 volunteers. With Mugoya now at the helm, Watoto Wasoka has expanded the football programs started by the organization’s founders. 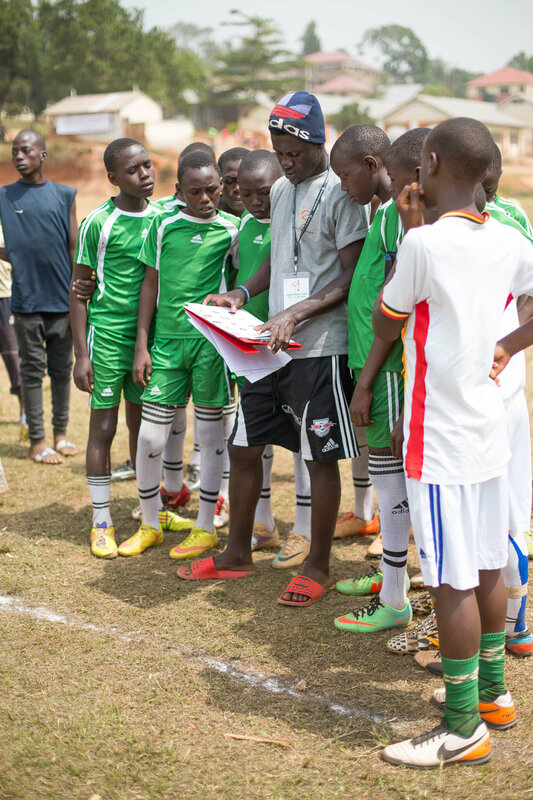 It offers football training to dozens of boys and girls from the impoverished areas of Kampala, runs a primary school league for over 800 kids each weekend, and hosts tournaments for thousands of kids from throughout Uganda. . The players, who range in age from eight to 18, are presented to representatives of primary and secondary schools with the authority to offer scholarships. Players have had success on and off the pitch, with several kids having gone on to football careers in Uganda, Sweden and South Africa. Further, more than 200 kids have been able to obtain scholarships, thus having had access to educational opportunities that would not have otherwise been available to them. The organization also tries to use football as a social development tool, and designs exercises in a way that allows the kids to practice their skills, but also teaches them about sanitation, health, hygiene, and how to avoid HIV and AIDS. Kids involved with the organization are also offered computer training, as well as a place to stay if their home lives become problematic. New York City based photographer Samantha Hyatt visited Kampala during the Christmas Camp, one of the biggest tournaments organized by Watoto Wasoka, and was impressed by the high quality of play, and even higher ambition. “A lot of the younger kids that I spoke to said they want to be just like Ronaldo,” said Hyatt, proving that kids in Uganda are not dissimilar to kids in Lima, London or Lisbon. “Part of their goal is to get out of their impoverished lifestyle and become professional football players,” she continued, showing that for some, the stakes are a bit higher. Though a professional career may be the future for some, the opportunities provided by Watoto Wasoka are having a transformative impact, even for those not destined for a spot in Barcelona’s starting eleven.